Well, time for post #1 of this week's American Idol. I knew this week would be better, now that their first live performace of the season is out of the way... & it was! Much better. For most of them. Also, my opinion changed a lot this week. There are some who i LOVED that i no longer care for & some that i thought should go home right away that I'm kinda liking now... my opinion has changed a lot... of course, next week could quite possibly change all that. But here is what i think based on tonight (as much as I can base it on tonight only because sometimes i just can't help their past performances creeping into my view...). I am going backwards from least favorites to favorites. Just ignore me if you disagree, my opinions change often at this stage of the game! #9 - Tim - I am so sorry, Tim. So sorry. You seem like such a sweet guy & you are humble, but Ellen is right. You need to do something else, like try acting, becausing singing is NOT your strong suit. You are all over the place pitch-wise, you don't sound "right" with the band, i really am not making sense because i can't quite pinpoint the problem. Nice tone to your voice, but pitchy. Or something. 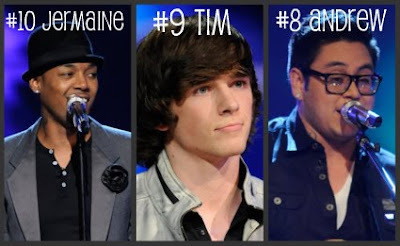 #8 - Andrew, what happened?!?! You were in my Top 4 last week. You just get worse & worse. Bring us back the cool stuff. You wowed me with your version of Straight Up. The next time i heard you (last week) was forgettable - seriously - i can't remember it right now! Except that it was good but not as good as before. Kara is right, you get worse each time. There's nothing new with you. The ONLY reason you beat Tim in my post is because that Straight Up thing was one of the best things i've seen this season out of all of it! #7 - John. You were MUCH improved from last week. But i 100% agree with the judges: there is no connection. No emotional connection to what you are singing. You have to think about the lyrics & sing them like you GET IT. This is, to me, one of THE most important things in music, because you are trying to convey a song to an audience. I thought it was the perfect song choice for you, though & i like your voice. #6 - Alex, you made me like you more this week. Much improved from last week also. Good voice. Still not my FAVORITE, but you do have a great tone to your voice & i love your humble attitude. You're sweet. But you do need to cut that mullet! ICK! I hate to see either one of you go because i think you are going to get better & better & i want to watch it happen! Yeah, i'm pretty sure i will lose some readers right here! Or else they'll keep reading thinking i've lost my mind. My mom LOVES Aaron; everyone else adores Casey. These are not at all NEAR where the others i've mentioned are; they're much farther along. 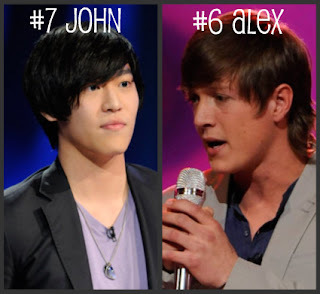 I couldn't even put them in the same collage as John & Alex because they are in a totally different league (in a good way). 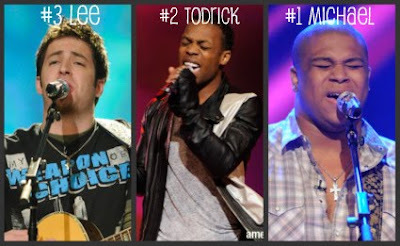 HOWEVER they are NOT better than my top 3. At least, tonight they weren't. #5 - Aaron. I love you, you're adorable, you're getting better & better & your voice is amazing. You're a natural. End of the song was shaky or something; i think you just messed up, but the rest was PERFECT. Keep it up! 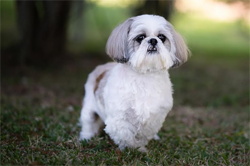 #4 - Casey! I was disappointed in you tonight! The only thing keeping me watching was you playing a MEAN GUITAR & those GORGEOUS navy blue eyes. Seriously. Your eyes are amazing. Anyway, yeah. This was my LEAST favorite performance of yours. I am sure you will do a million times better next week & be back in my favorites. #3 - Lee. I LOVE YOU! I did not even mention you in last week's blog, but something about you tonight made me LOVE YOU. First, your video before your performance. There is a humbleness about you that i didn't realize. And i thought this was your best performance yet. The only tiny thing i have to say is to enunciate, PLEASE eununciate, i couldn't understand some of your words & that is a pet peeve of mine! #1 - Michael, you were my favorite performance of the night. Vocally & song choice. FANTASTIC JOB! 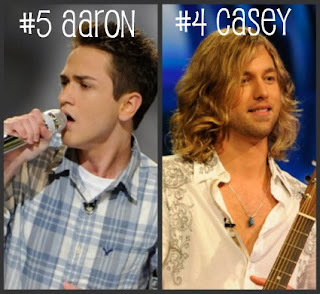 I think You're top three are great except I'd put Casey over lee just because of his mad guitar skills!! I though Aaron was way to little boyish but has an awesome voice. and I didn't like todricks voice last night. He's not one of my favs... The bottom three are spot on!! I LOVED Alex last night Most improved by far!! !